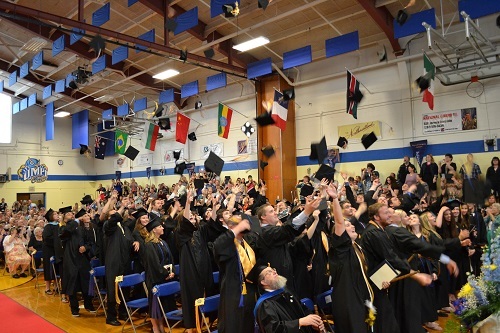 One hundred and fifty-four students graduated from the University of Maine at Presque Isle on Saturday, May 14, during the 2016 Commencement Exercises – the University’s 107th Commencement ceremony. President Linda Schott conferred degrees for the 2015-2016 academic year upon 85 students who participated in the ceremony held in Wieden Gymnasium. Nicholas C. Donohue, a leader in education transformation and champion of equitable learning opportunities for students, addressed the graduates as this year’s commencement speaker. During the graduation event, he was presented with an Honorary Doctor of Humane Letters Degree. Donohue currently serves as the President and CEO of the Nellie Mae Education Foundation and is leading efforts to reshape New England’s public education systems to be more equitable and more effective for all learners. As a sought after thought leader in education transformation, Donohue has worked tirelessly to promote equitable learning opportunities and close the achievement gap. Throughout his career, he has championed innovative approaches to expand access to high quality learning opportunities for all learners, especially for those who are underserved. His work in education throughout the New England region includes serving as Special Master at Hope High School in Providence, Rhode Island, and Commissioner of Education in New Hampshire. In 2015, Donohue was named as one of the “50 People Shaping the Future of K-12 Education” by Getting Smart, a mission-driven organization and online community focused on accelerating and amplifying innovations in teaching and learning. Additionally, he serves on the Boards of Directors for the International Association for K-12 Online Learning (iNACOL) and Grantmakers for Education (GFE). During UMPI’s commencement exercises, Chancellor James H. Page delivered greetings on behalf of the University of Maine System. As well, Jefferson Ashby, UMPI Board of Visitors Vice Chair; Jacquelyn A. Lowman, UMPI Faculty Assembly Chair; and Tom Wire, UMPI Alumni Association President, offered remarks on behalf of each organization, respectively. 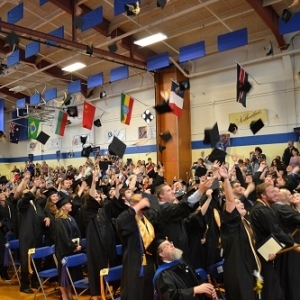 This year’s Commencement was live streamed on the University’s website so family and friends who couldn’t attend would have the opportunity to see the Class of 2016 graduate. Viewers from around the world were expected to tune in for the ceremony. A few-year-old tradition at this year’s event was the pinning of all marching graduates with a special symbol of campus. Each graduate was given a lapel pin depicting a snowy owl with its wings outstretched in flight. Meant to symbolize how each of them is spreading their wings and soaring on to great heights, graduates were asked during Commencement, “Where will your wings take you?” They will have the opportunity to share their stories—about contributions they make in their career fields, ways that they serve their communities, and adventures that they have around the world—on the website www.umpi.edu/yourwings. All alums, not just this year’s graduating class, are encouraged to add their stories on this site.